HOUSTON (ICIS)--US spot ethylene values continued to fall, with front-month trades at 13.50-13.75 cents/lb on Wednesday, matching lows from February 2002. Front-month April ethylene had last traded at 14.25 cents/lb on Monday. New ethylene capacity and good production from existing crackers along with a slow ramp-up of new downstream polyethylene (PE) capacity has allowed supply to outpace demand. Two more crackers are expected to start up this quarter, and several more before the end of the year. Sentiment was further softened in early April when China proposed 25% tariffs on several US products including some grades of PE. Much of the new ethylene and PE capacity coming online is geared toward future exports of PE, with China expected to be a key market. Demand growth in the US and in traditional export markets like South America is not expected to be able to absorb the increased PE volumes. Production costs may be offering some stability to spot ethylene values. 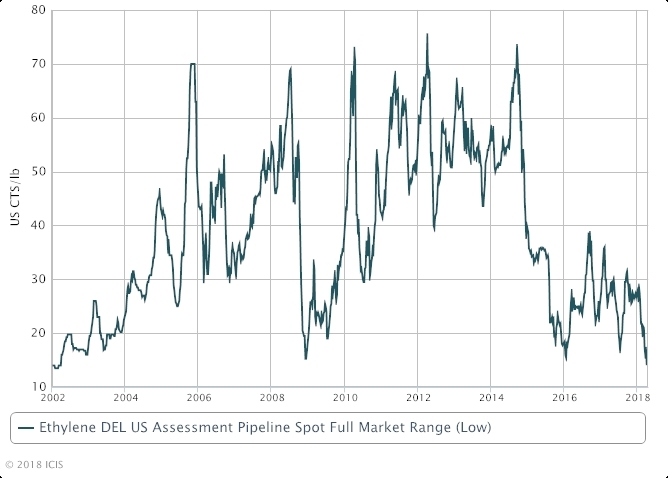 Front-month ethylene had been trading at 14.00-14.25 cents/lb since a 16-year-low on 6 April, matching lows last seen in March 2002. US ethane feedstock spot ethylene cracker margins have been on a downtrend through early 2018 as spot ethylene prices have weakened. Margins were at 4.43 cents/lb for the week ended 13 April, a nine-year low. Margins rose by 0.7% for the week ended 20 April as feedstock ethane costs fell and as co-product values rose.